The Olympic Torch relay, soon to culminate in London, is the grand daddy of all relays, starting in one country, traversing many others, then ending its journey at the site of the Olympic Games. It passes through many athletes’ hands while on its journey, its final purpose being to light the Olympic Flame. Less glamorous, though still useful, is the relay race that often takes place within digital controls. Last time we looked at my design solution for the control of a microprocessor controlled medical x-ray film developing machine, where a field effect transistor (FET) acted as a digital control interface between a 5 volt direct current (VDC) microprocessor and a 12 VDC buzzer. Well, controlling the buzzer wasn’t the only function of the microprocessor. It also had to control a 120 volt alternating current (VAC) drive motor, the purpose of which was to move x-ray film through a series of processes within the machine. Yet another requirement was that the machine’s drive motor run 40 minutes upon activation by a start button, then shut off. 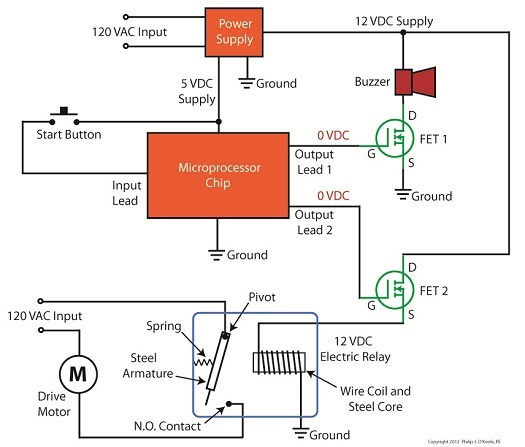 One of the challenges presented by this specification was that an FET standing alone is only suited to control direct current devices like the buzzer, but not alternating current devices like electric motors. Direct current flows in one direction only when traveling through wire, and since an FET can only pass current in one direction it is the perfect match for those applications. Now, as the name would imply, alternating current flow alternates, that is, it reverses direction and varies in intensity many times each second. This is a scenario that FETs are not equipped to handle because they can’t deal with reverse flow. This meant that, for the purpose of my developing machine, I could not use an FET to directly control the 120 VAC motor. Now let’s take a look at Figure 1 to get a basic look at how I solved the problem. Figure 1 shows not one, but two green FET’s, each branching off from the microprocessor chip. We’ll call them FET 1 and FET 2. If you recall from last time, the buzzer works on 12 VDC, so FET 1 works well as a direct interface between it and the microprocessor chip. But in the case of FET 2 we need an intermediary device to handle the alternating current motor. That device is a 12 VDC electric relay. In an earlier blog series on industrial controls I discussed how electric relays use electromagnets to power light bulbs and motors on and off in response to someone pressing a button on a control panel. We have very much the same mechanics at play in our developing machine. The relay will power the motor on and off in response to the computer program running within the 5 VDC microprocessor, a programming sequence that is initiated by someone pressing a button. To get the motor control to work in the machine, the gate (G) of FET 2 is connected to another output lead on the microprocessor. We’ll call that Output Lead 2. Then, the source (S) of FET 2 is connected to the wire coil in the relay. To tap into the power source for the relay, the drain (D) of FET 2 is connected to the 12 VDC supply. Finally, the other end of the relay coil is connected to electrical ground. Next time we’ll activate the pushbutton and see how the control initiative passes along a path in a manner reminiscent of the flame in an Olympic Torch relay, but here it passes between the microprocessor, the FET and electrical relay, culminating in power to the drive motor. This entry was posted on Monday, July 9th, 2012 at 1:25 pm	and is filed under Engineering and Science, Expert Witness, Forensic Engineering, Innovation and Intellectual Property, Personal Injury, Product Liability. You can follow any responses to this entry through the RSS 2.0 feed. Both comments and pings are currently closed.